At the last minute, I decided to throw a very small gathering Hannukah Party. And of course, what’s a Hannukah party without Latkes. I usually make sweet potato latkes, but this year I decided to get a bit more rebellious and cook with my most favorite ingredient . . . MOLASSES! If you want to read more about the health benefits of molasses, check out the Frankenstorm Chocolate Chip Molasses Brittle Cookies Recipe. 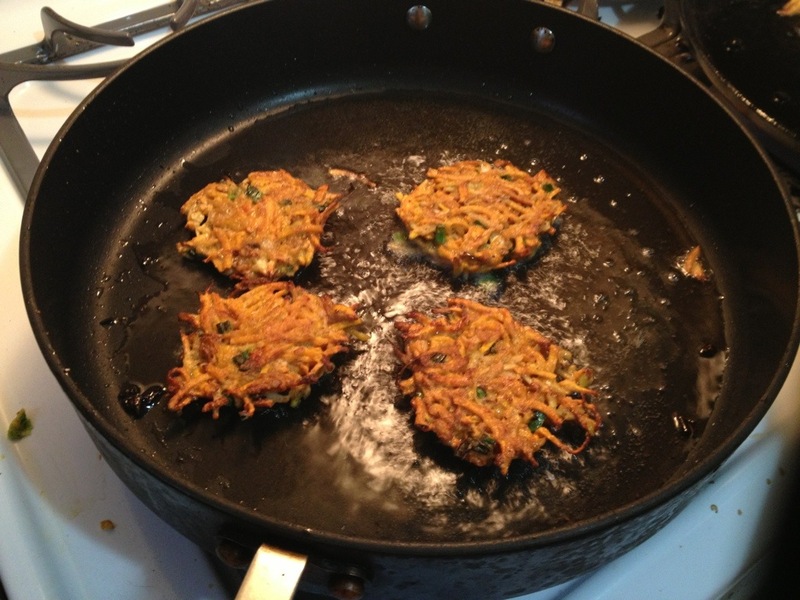 My specialty is sweet potato latkes. When I realized I only had two sweet potatoes in my kitchen, I knew creativity was to be born! I decided to mix the sweet potatoes with butternut squash, but that would cut the sweetness. I then decided to add apple to give it a sweet burst, and upon looking in the fridge, I had this burning desire to use my parsnip. Well, then I concluded I needed it to be a bit sweeter, which gave me an excuse to use my favorite ingredient. That’s right! You guessed it . . . BLACKSTRAP MOLASSES! Personally, I thought the latkes were sweet enough without the molasses, but my guests thought the molasses really hit the spot. Frying Oil – Coconut, Canola, etc. 2. 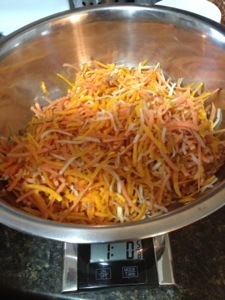 Grate the potato, squash, apple, and parsnip and put in separate containers. 2. Grate the potato, squash, apple, and parsnip. The apple will need to be squeezed out. I used a ricer to squeeze out the juices, which I caught in another cup and drank! 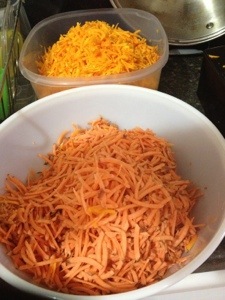 Then mix all the food you grated together in a large bowl. If you decided to create your own base ingredient mix, then make sure that together it weighs about 1 lb or 16 ounces. 3. Chop onions and scallions and toss them into the mix. 4. Add salt and pepper and toss. 5. Add slightly beaten egg and molasses and toss to mix evenly. 6. Add 1/2 cup of your gluten-free flour blend or 1/4 cup of a gluten-free 1/4 cup of a starch. I use my hands to mix this in really well and make sure the consistency is just right. If not, I add about a teaspoon at a time of more flour. For one batch I used a gf flour blend, and another batch I mixed 1/4 cup of brown rice flour with 1/4 cup of tapioca starch. As for flours, just pick one with a milder flavor and any starch will do. Some people like to use potato starch, since you’re cooking with potato. Other recipes call for only starch, but I really prefer the starch/flour combo or gf flour blend. 7. Add oil to your pan so that it comes up about 1/4 of an inch high. I set the burner to right below the highest heat setting and wait about 5 minutes to make sure my oil is good and hot. 8. While the oil is heating up, I put parchment paper on a baking sheet, and set that in the preheated oven. 9. Then, I use my hands to make about a 2″ in diameter flat pancake. I lay that on a spatula, and gently put it in the oil. I put about 4-5 latkes in the oil so as not to decrease the heat too much. You want the oil to bubble when you put it in. I cook it for about 1-2 minutes per side. When the edges start to brown, then you know to flip it. 10. When the latkes are done, I transfer them onto the baking sheet in the oven. 11. When all the latkes are completed, I turned my broiler onto low and just finished them off in there so that they would be super crispy. 12. You can top with applesauce, sour cream, or some other fun dip! The latkes turned about to be AMAZING!!! I was so glad I made 3 batches for 7 1/2 people. I would not have had enough! I like to eat what’s in season, believing that I derive lots of needed nutrients from the seasonal plants. Remembering that winter is a time of hibernation, and the sun, too is hibernating we often times feel seasonal depression from the shorter days or just a waning of energy. Many root vegetables live in the ground, and though they can have stems and flowers, most of these stems and flowers have died off and also gone into hibernation, returning their energy back into the ground. Therefore the plant’s energy has shifted from creating flowers into its root by storing nutrients and minerals. So, if we eat the roots of these plants during the winter, we are eating them at their fullest energy potential to help us energize through the darkness days. Check out this link if you want to read more about the health benefits of root vegetables. 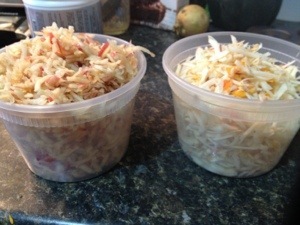 This dish is one of the most simple dishes that I make, and other than chopping, there’s little prep work involved. I usually use whatever I have on hand in my fridge especially when I’m trying to clean my fridge out. Since I tend to use whatever I have on hand, the technical term for the vegetables is root crops, because as you’ll soon read, they are not all roots. I am obsessed with researching and learning, which brought me to learn exactly what types of food are really going into this dish. I will go into more detail below, but if you do not have the same passion that I am possessed by, no worries! Just skip down to ingredients below. Roots – are the organs of the plant that absorbs water and nutrients, anchors the plant to the ground, and stores food and nutrients for the plant. Bulbs – consists of layers that grow underground and store food for the developing plant. Corms – resemble bulbs, but have a solid mass of tissue instead of layers that grow vertically underground. Rhizomes – a shallow stem that grow horizontally underground. Off of rhizomes grow roots, and part of the plant can appear above ground. Tubers – have leathery skin and eyes. They are underground stems that grow thick instead of long. Tubers: sweet potatos, white potatos, beets, celeriac, rutabega, etc. Winter Squash: hubbard, butternut, acorn, etc. You’ll want to have a glass baking dish about 9×12 on hand. 2. Throw all ingredients above (minus the olive oil) and toss in a glass baking dish. Drizzle olive oil over vegetables and toss again. 3. Put vegetables in the oven, tossing them every 20 minutes for about an hour. I like mine a bit crispier, so if you like them a little al dente, then check them after about 50 minutes or so. 4. Serve hot! It makes for great leftovers, too.